This post is sponsored by Green Sisterhood. I received products to review but was not compensated for the review. All opinions are my own. Just in time for Mother’s Day, I have some fabulous bath and body products to share with you from Herban Lifestyle. The mission of Herban Lifestyle is to make the world a happier, healthier, better-smelling place! They are certiﬁed sustainable by Green America, Cruelty-Free by Leaping Bunny and is a Safe Cosmetics Champion. Since bath and body products readily enter your body through your skin, Herban Lifestyle products are made with the highest quality ingredients: pure oils, essential oils, and herbs that are certified organic, pesticide-free, chemical-free, ethically wild crafted and/ or Fair Trade. You will never find artiﬁcial preservatives, synthetics, artiﬁcial fragrances, artiﬁcial colors, petroleum-based ingredients, or GMO's in any of their products. Herban Lifestyle founder Mary Kearns began making her own herbal bath and body products to share with friends, family, and at her local farmers market in 1999. In addition to being passionate about healing herbs and aromatherapy, Mary is also passionate about sustainability and considers the impact upon the environment in every aspect of her business. For example, Herban Lifestyle is 100% Wind Powered and an EPA 100% Green Power User. They also donate a portion of their revenues to environmental non-profits. They use recycled, recyclable, or biodegradable packaging. Herban Lifestyle sent me four products for free to try and review. Shampoo bars are such a fabulous option if you are looking to reduce your plastic use. Shampoo bars make so much sense since the first ingredient of bottled shampoo is often Aqua (aka Water). Herban Lifestyle’s packaging is a simple cloth bag (which can double as an elegant gift wrap). Many folks find they can skip a conditioner once they switch to a shampoo bar because it doesn’t strip out your natural oils the way regular shampoos, especially those containing detergents, do. We are veteran shampoo bar users at my house. 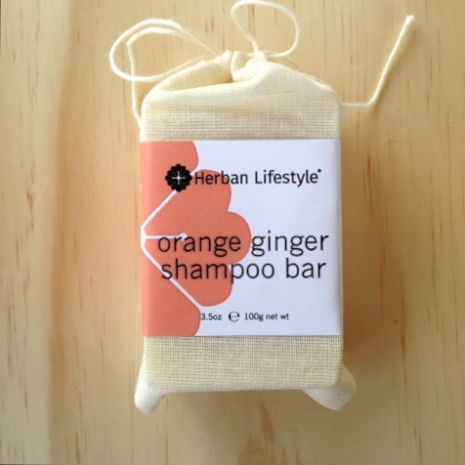 How does Herban Lifestyle's Orange Ginger Shampoo Bar compare to the other bars I’ve tried? Good sudsing (this is an important part of the shampooing experience for many), fabulous scent, and very moisturizing . We would definitely purchase and use this shampoo bar again. Note that some people worry they will go through some kind of transition period when they switch from regular bottle shampoo to natural shampoo bars. I did not find that to be the case. For me the switch was easy-peasy. Just clean, healthy, moisturized hair right off the bat. The Papaya + Black Tea Facial Cleansing Grains is a product I probably would not have purchased myself as I am pretty minimalist in the personal care department, but I have really been enjoying these gently cleansing, mildly exfoliating grains. I have been using them about once a week while in the shower. I simply put a small portion (1/2 teaspoon) in my hand, add a very small amount of water, rub the paste all over my face, then rinse off with hot water. Afterwards, my skin feels soft and rejuvenated without any dryness. Using these cleansing grains is the closest thing I’ve had to a spa experience in a long time. They are such a fabulous alternative to those ridiculous plastic micro-beads that are finally getting banned everywhere. I also love that you add the water yourself at home. Same idea as the shampoo bars – letting you add the water yourself is a great way to reduce resources used for packaging and shipping. The 2 oz glass jars contain enough grains for about 30 washes (I think I could get more, because I used closer to 1/4 teaspoon than 1/2). 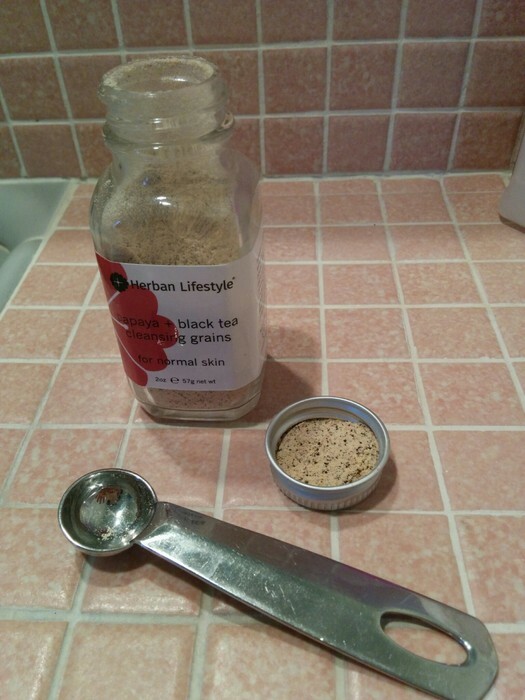 Also, Herban Lifestyle will soon be offering refillable grains so you can reuse your glass jar. The small bottle may seem a little pricey, but a little really does go a long way! The Orange Tangerine + Vanilla Lip Creme has been great to use the past few weeks as we are having very dry, very windy weather. So soothing for dried chapped lips. Since lip products are not only absorbed through the skin but also frequently ingested, I am especially careful with products that I place on my lips (or that I let my children place on theirs). 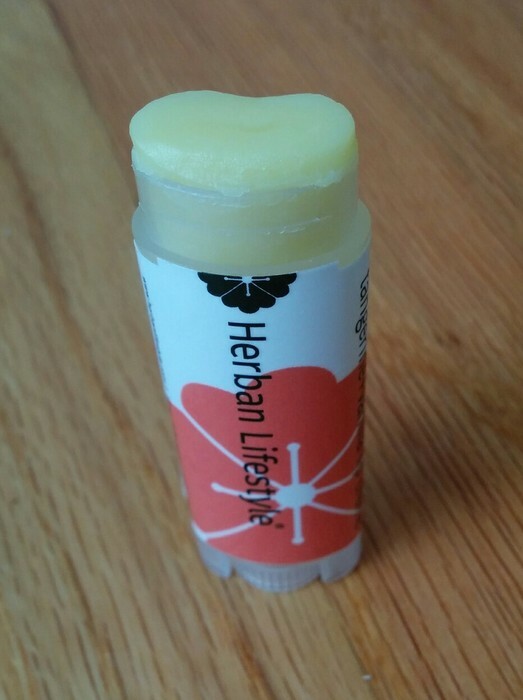 I love the simple ingredient list of this lip crème: organic and fair trade coconut oil, organic beeswax, organic olive oil, organic sunflower oil, organic tangerine essential oil, organic vanilla absolute, vitamin E. With Herban Lifestyle, you never have to worry about sketchy ingredients. One of the many benefits of shopping with a trusted eco-friendly seller. I have never used body butter before, and I have to say I'm still getting used to it. 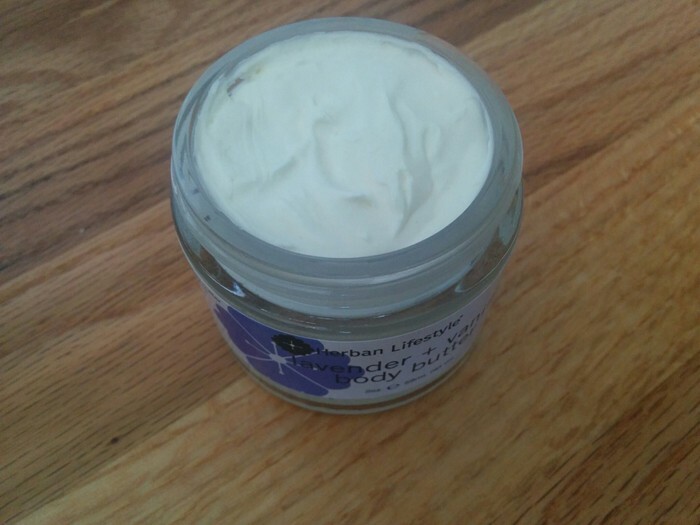 Unlike regular lotion, the Lavender Vanilla Whipped Body Butter leaves a protective layer or barrier that helps keep moisture in the skin (this layer eventually wears off, especially after washing hands with soap). I have been trying using it overnight on my hands, and it is helping heal some extreme dryness and cracking caused from washing with conventional hand soap in some public restrooms a few times as well as very frequent handwashing due to some yucky germs going around my house. The body butter does look, feel, and smell extremely yummy. After trying these four products and researching Herban Lifestyle's ingredients and sustainability, I can heartily recommend Herban Lifestyle products to you. As someone who frequently anguishes over purchasing decisions, I just love being able to buy amazing and totally safe products while also supporting a small, sustainable, ethical business. Win win win! These delicious smelling, gentle yet effective bed and bath products would make any mom very happy. They would also make a perfect gift for a baby shower, wedding shower, graduation, or birthday. Or just buy some for yourself for a little self-care and self-pampering. Try them out and let me know what you think! 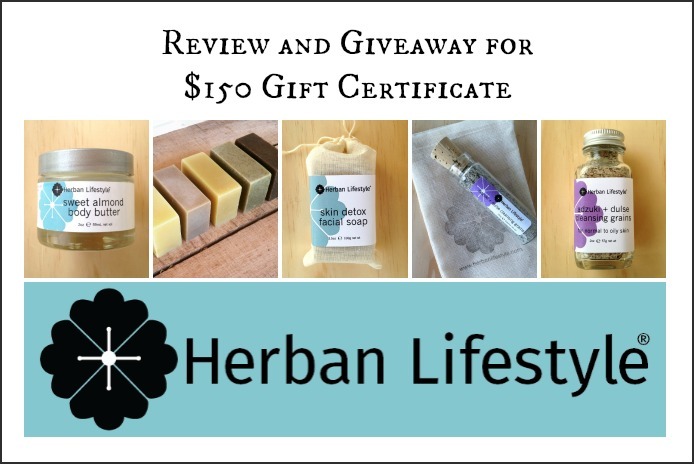 I’m very excited to be able to offer my readers the chance to win a $150 gift certificate to Herban Lifestyle! $150 is a lot of dough! Enough to buy some products for you, your mom, and some very close friends. Simply enter using the Rafflecopter below. Giveaway ends at 12 am EST on April 28. Good luck! I really need to try that shampoo bar! I fell of the shampoo bar wagon a while ago and I honestly don't even remember why but that scent sounds divine.